CTF ILLINOIS CILA homes are just that... HOME. CTF Illinois has 32 community homes and serves over 200 people residentially within our CILA program. Willie in the kitchen at the Cedar Lane CILA. Each of our homes are adapted and personalized to meet each resident's style, as well as their physical and emotional needs. Individuals will share their home with 2 to 7 peers and they will take an active role in all activites within their home. CTF ILLINOIS implements person-centered planning by which services within the home are developed based off of the choices and needs of the individual. Our trained staff will teach and guide the individuals to be as independent as possible, learning new skills in self-care, cooking, cleaning, money management and how to be a good citizen. 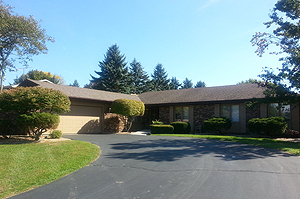 CILA Home on Cedar Lane in Crete, Illinois. Residents of our homes are active in their community. They visit local establishments and engage in community events regularly. The residents are also active members in local churches, gyms, and volunteer organizations. CTF Illinois member homes have 24 hour supervision provided by trained staff that are dedicated and passionate to see that each individual reaches their goals while ensuring a safe environment. 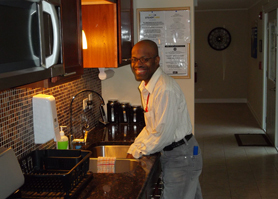 Each home is supervised by a highly-trained Community Living Director who provides oversight to day-to-day activities. The Community Living Director manages all staff, oversees day-to-day services, and is, overall, responsible for ensuring appropriate supports and care. A Nurse, on call 24 hours a day, provides monitoring and medical services. Therapy services are available. They include speech and communication, occupational, physical, dietary, and behavioral. CTF ILLINOIS CILA homes are licensed by the Department of Human Services. Homes can be found in the following Illinois cities: Champaign, Charleston, Chicago Heights, Country Club Hills, Crete, Flossmoor, Homewood, Lincoln, Mattoon, Olympia Fields, and Sumner. For more information on the "CILA" services provided above, please call 217-352-1557.